your undesired behavior was before. After a few weeks of school, I could tell which of my students were going to be a challenge in terms of behavior. If I had had students the previous school year, I already knew a lot about them but things can change over the summer so I always tried to wipe the slate clean and start afresh. But once the novelty of the new school year wore off, students began to act more naturally and for a few of them, that meant acting out. Over the years, I found three tactics to be most effective in maintaining a positive classroom atmosphere that maximized learning opportunities for everyone. Today I’ll muse about my number three behavior tactic and in my next two posts, I’ll write about the others. 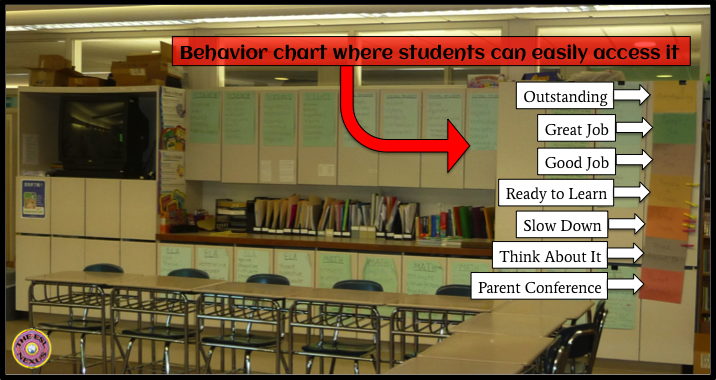 #3: Use a behavior chart. While this may be obvious for elementary teachers, I found that it was helpful even with my older students. 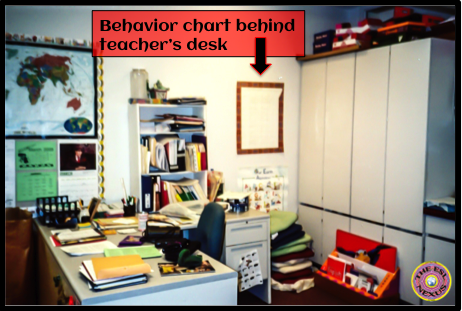 When I first started using a behavior chart, I modeled it after the ones I saw in elementary classrooms, with students’ names listed on the left and the dates running along the top. Students earned checks for each class in which I decided they had had good behavior and when they earned a certain number of checks, they could pick a prize from a prize box. But that kind of chart was based on my subjective interpretation of what was good behavior. Many years later, I saw another behavior chart which I liked much better. Instead of listing students’ names, it listed stages of good behavior, from Outstanding as the most desirable to Parent Conference on the other end. Using clothespins with their names on them, all students started off in Ready to Learn and moved their clothespins up or down as their behavior warranted. And even though I still directed the process by telling students when to move their clips up or down, they could also move them when they did something great that I wanted the whole class to recognize. For example, if a students asked a really good question or did something positive on their own initiative, they could move their clip up. And when they reached the top, they could select something from the prize box. What I really liked about this chart was that a) it let the students get out of their chairs and walk a bit during the lesson, giving them a small amount of physical activity and b) it rewarded or chastised behavior as it happened and every student had infinite opportunity to do well or do poorly—it was all up to them, unlike the other chart which was a one-time thing at the end of the period. One thing I started doing part way through the year was, if a student asked if they could move their clip up, I decided that wouldn’t be allowed. I didn’t want students to be rewarded for doing things they were normally supposed to do or have them do things just so they could receive a reward. (The prizes, by the way, were just small trinkets I bought at the school store for twenty-five cents to one dollar, such as erasers, pencils, magnets and such like.) I wanted the students to behave well and be good students because they intrinsically wanted to, not because they wanted a prize. Of course, students never liked moving their clips down and if they got to the Parent Conference level, they never wanted to move them there. In those cases, I often had to move the clips myself. But I gave the students an out: I told them that if their behavior improved during the remainder of the lesson, I wouldn’t ask for a conference but would just email their family instead. Most of the time, the students stopped pouting and cheered up at that, and their behavior did improve. I liked this chart better than the first one because it put more responsibility on the students for their behavior. And middle schoolers do like to feel in control! In fact, the following year, I decided they were too old for a behavior chart. But my 7th and 8th graders, who’d used it the year before, actually clamored to use it again! Of course, I was happy to oblige them. Next Monday, some musings about my #2 Behavior Tactic.